Stomach troubles are frustrating enough to us humans, it’s hard to imagine how they might make your beloved pet feel. When your dog is another member of your family, it can be difficult to see them in pain due to stomach issues like gas, diarrhea, or vomiting. Stomach troubles are frustrating enough to us humans, it’s hard to imagine how they might make your beloved pet feel. The first step to helping your pet with tummy troubles is to identify if a visit to the vet is needed or not. If the problems have lasted more than 24 hours, a trip to the vet is almost always a good idea. Even before the 24 hours, if you believe your pet has eaten something it shouldn’t have, or if they seem to be in serious condition getting them to the vet quickly can be the difference between life and death. That said, there are several instances where simple TLC is all they need, in these situations small diet changes can be helpful. In some instances, your dog may benefit from a temporary fast. While they should always be provided with an ample supply of water, withholding food for 12-24 hours may be what is necessary to help get the digestive system back on track. 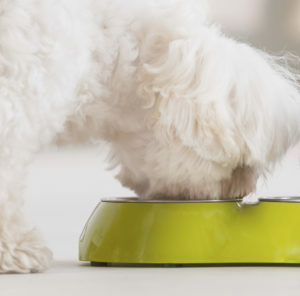 Over those 24 hours, you can introduce small amounts of your dog’s regular food again to keep stomach acid in check while giving the digestive system time to rest. Giving your dog a food source that is easy to digest can help get their appetite back and their system on track. Simple starches like white rice and millet are natural for your pet to digest while also being soothing. Likewise, adding protein like steamed fish or turkey, cooked egg, and cottage cheese can fuel them with vital nutrients for a swift recovery. Complex meats like beef and pork should be avoided until your dog’s symptoms are resolved as they can be difficult to digest. When humans are sick, we often turn to these two foods because they are hydrating, full of potassium and have plenty of fiber to help the digestive system. If your dog is having tummy troubles, these fruits are just as good for them as they are for you. Banana and apple sauce can be given to your dog in a rate of one teaspoon to every ten pounds of body weight daily. We understand you have a choice when deciding on the care for your pets, and we strive to provide you with unparalleled services including wellness exams, vaccines, lost pet microchip ID, dental care, surgical services, digital radiography, and in-hospital laboratory services and diagnostics. Other highlights of Alexander Animal Hospital are the separate cat and dog waiting and exam rooms, as well as after-hours on-call emergency services. This entry was posted on Friday, April 5th, 2019 at 2:36 pm. Both comments and pings are currently closed.